I feel like I’ve heard this song so many times before that the artist has to work extra hard just to even keep my attention. Sam Hunt works pretty hard to do that. Not as a vocalist, mind you. But as a songwriter, which is what’s put him on the map in the first place. The rapid-fire lyrics are easy to miss, as all is in service to the rhythm of the record. But there are some very cool turns of phrase and descriptors throughout the song. I particularly liked, “The sun’ll steal the magic from us soon, so let’s take one more trip around the moon.” Also, rhyming “Cali” and “rally” is one I haven’t heard before. I tend to like songs that are more character-driven than mood-driven, which is why I tend to prefer this theme when it’s done by Kip Moore or Keith Urban. But I wouldn’t turn the radio off if this came on, and I’m interested to hear more from him. Those are two of the best endorsements that I can give these days. I actually quite like this one, even if it’s 0% country. I agree with your point on character driven being way better than mood driven. For a pop song, this is quite competent and I can even see myself nodding my head to and humming on a bright day where I’d rather not think so much and just soak in the scenery. This just doesn’t have any place whatsoever on country airwaves. I genuinely think “On The Verge” is an admirable idea that is nonetheless terribly executed for two key reasons. Firstly, the favoritism surrounding it leaves a bad taste in my mouth. What makes Craig Campbell more deserving of his already struggling single at the time more deserving of this enviable form of exposure than, say, Brandy Clark’s “Stripes” or, even among mainstream releases, something like Chase Rice’s atrocious current single? (which has inched week by week until most recently into just beneath the Top Twenty). And what makes Sam Hunt so special to the degree his first-week airplay is nearly rivalling the radio debut of Kenny Chesney’s “American Kids”? Granted I’m no fan of top-tier artists regularly storming with each of their lead releases right out of the gate either……….but at least you can expect that, and at least you know these particular artists have worked hard to get where they are now. Sam Hunt has NOT earned that right. Craig Campbell has NOT earned that right. And even if we were to reward both these entertainers with such a boost right out of the gate, then at the very least “On The Verge” ought to consistently reward those who are truly buzzworthy. Secondly, in relation to the first point, what happens when one artist solicits all this airplay? It comes at the expense of the airplay others would otherwise receive. Thus, spins that would have gone to other charting entertainers are redistributed to this sole personality………..and that can negatively affect chart momentum for multiple up-and-coming artists. That same week “Leave The Night On” had its hot-shot chart debut, an alarming number of songs beneath the Top Twenty reported a net decline in spins and eye-popping backward bullets. How is it healthy for the format when many of these songs, which are driven traditionally by listener feedback, are completely disregarded in favor of a novel approach to simply force every station to play the song because Clear Channel finalized a deal with the label to play the song at the top of every hour in its first day or two of release? It’s not. It is disruptive to the natural flow of chart movement and momentum, and it hurts much more than it helps other newer artists aspiring for visibility. 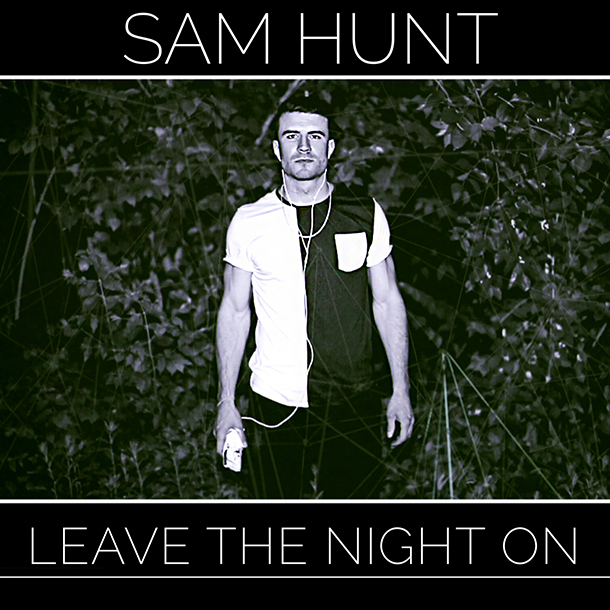 What I find strangest about Sam Hunt is that he doesn’t seem to sing with any twang. Usually singing with a southern accent is the only indicator that a song is supposed to be country. Since he doesn’t, and this song is straight pop, it feels kind of out of place on country radio to me. Hunt also dresses like an EDM artist, not like a country singer. I saw his picture and it reminded me of Zedd or something. I guess we’ve reached the point where country artists don’t even need to pretend that they’re country artists. …maybe i’m experiencing some kind of “groundhog day” today, but ain’t this florida georgia line’s “get your shine on” revisited. if i’m wrong – it doesn’t impress much either. I get the animosity toward Country radio programmers…they latch onto a trend and then run it into the ground. But I’m not sure this song deserves the animosity that Noah has expressed. Yes…it’s very much a pop song in structure, but thematically it fits right in with the current Country music landscape (and specifically next to Hunter Hayes). I’d much rather hear this than another Florida Georgia Line abomination. And the other writers of this tune are same guys we’ve been praising for Kacey Musgraves’ debut. Pop influences have regularly worked their way into Country over the past fifty years (“Crazy,” anyone? ), so this current iteration of a pop invasion isn’t exactly unexpected. I like the song, and there’s a decent chance they might try to cross it over to the pop world (esp given the face on the record), but I can’t hate it for what it is when it’s executed as well as it is. I’m with John. I don’t like what Clear Channel’s doing, but we shouldn’t let that get ahead of song quality. In fact, this song’s lack of any identifiable “country” musical elements is the only thing that distinguishes it. Other that that, it’s just a typical “laundry list” pop-country feel-good tune just like hundreds of others I’ve been exposed to in the last five or ten years. “Girl you got the beat right, killin’ in your Levi’s, Buzzin’ like a street light…” Seriously, how is this better than Luke Bryan or Florida Georgia Line? I guess Sam Hunt is the father of “bro-pop,” a new musical sub genre I’m not much looking forward to. This song makes me wonder though: which would I rather hear blasting out of the FM radio at the next barbecue (or whatever): bad country songs over-loaded with twang and laced with phony “redneck” affectations, or bad country songs that contain little or no country elements at all? Do I really have to choose? Johhn, if you read my reflections in detail, you’ll see I actually didn’t bash the song per se. I actually stated, as a pop song, it’s a fairly enjoyable and solid effort. It’s the MARKETING of this song that I have issues with, as well as chart manipulation in how Clear Channel stations shoved this down the throats of countless listeners inorganically while also depriving other up-and-coming artists of crucial spins. Neither of these are really the fault of Sam Hunt himself, or the writers of this song. But I still maintain my belief that this doesn’t belong on Country airwaves any more than any Florida Georgia Line single shouldn’t have. Noah, I got that. My point was to your comment that the song doesn’t belong on Country radio. It fits in perfectly with where radio is, and the consumers who identify as Country fans (they’re not hearing most of this music anywhere else) are buying it. We can complain about the direction Country radio has gone, but the listeners now speak more actively by purchasing downloads. Sales don’t lie, even if we wish they would. Sam just happened to get a leg up because Clear Channel believed in the record. That’s not manipulation…that’s confidence that a song will work for their format. I don’t like it either, but like I said, I’ll take this any day over some of the other songs that have had that pimp spot (Kenny and Tim’s “Rock Star” being a prime example). This song only popped up on my radar yesterday and I love it for what is, a tasty bite, nothing more, but also nothing else. I particularly like the energy it exudes, unlike other variations on the theme I could name. As to whether it qualifies as country music, well, I distinctly recall similar debates back in (Lord help me) late 90s involving Shania Twain and Martina McBride. At that time, Martina’s “I Love You” (1999) was highlighted by one of my favorite DJs as an example of the future of country music. Boy I wish he’d been right… In any case, “Leave the Night on” doesn’t strike me as a pop song, definitely not in the context of 2014 pop music. Side note: the lyrics to this song include the phrase “on my brain” (meaning “on my mind”) which I’ve noticed used a lot in country music lyrics recently, but which strikes me as … well, weird. It’s not an idiom I am familiar with (and, interestingly, neither is the Corpus of Contemporary American English with only one attestation), so it largely strikes me as lazy rhyming. What do all y’all think?